Faux bois for the bath. 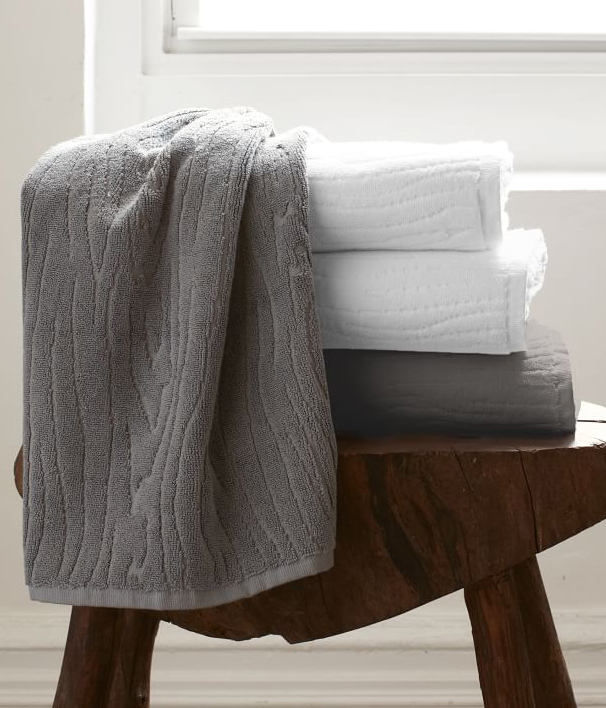 The textural tree-ring pattern of this Organic Wood Grain Towel brings the outdoors in in the subtlest way. $8-$24 Sale $6-$19. Buy here. 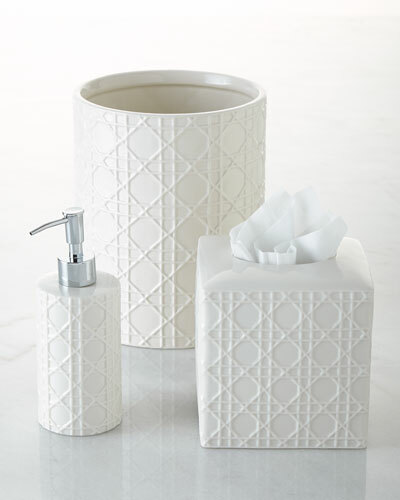 These white Cane Embossed Porcelain Vanity Accessories feature an embossed cane pattern. 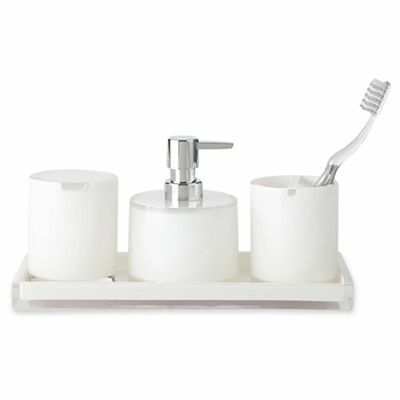 Set includes pump dispenser, tissue box cover, wastebasket, cotton jar, soap dish, tumber and vanity tray. $15-$72. Buy here. 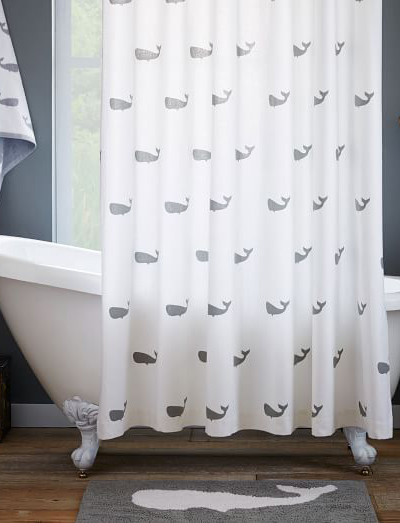 Add a nautical touch to your daily shower with this Feather Gray Whale Shower Curtain. Its 100% cotton fabric yields a crisp drape. $39 Sale $31. Buy here. Art and design collide. 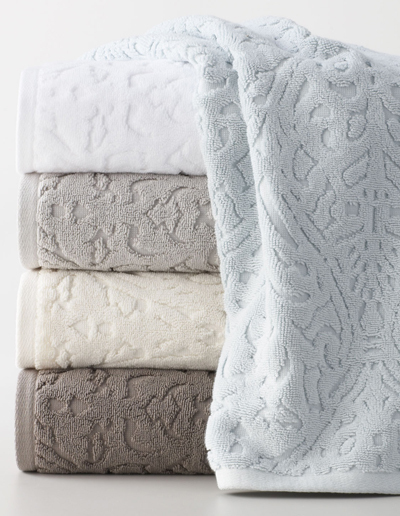 The results—these classically elegant Kassatex Firenze Towels that define casual luxury. Made of 100% long-staple, combed Turkish cotton, piece-dyed jacquard. $10-$35. Free shipping. Buy here. 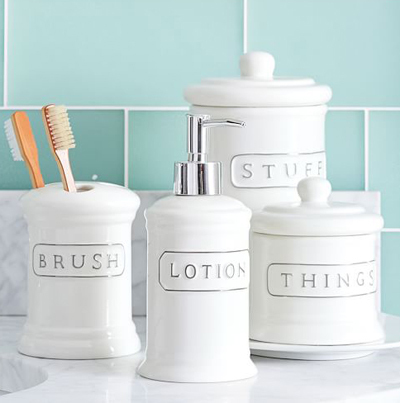 Detailed with raised silver type that identifies their purpose, these glossy Ceramic Text Bath Accessories bring wit and style to the bath. $15-$29. Buy here. 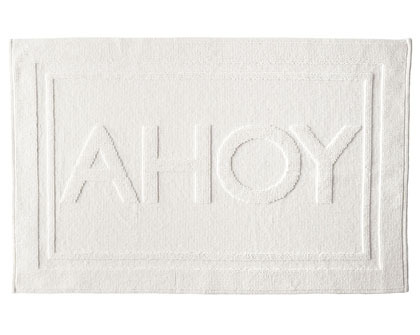 Cleverly engineered for a playful greeting, this cotton Ahoy Bath Mat is plush and full of personality. Truth be told, we like it as much for the master bath as we do the kids’ bath. $48. Buy here. An ethereal nature-inspired print defines a striking cotton Ingrid Shower Curtain in neutral hues designed to complement your bathroom décor. $39.99. Free shipping. Buy here. 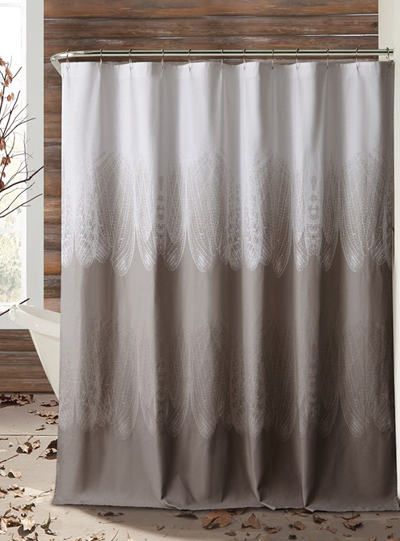 This Feather Gray Stripe Shower Curtain keeps the bathroom looking clean in pure cotton. Wide bands pair perfectly with modern tiles or traditional tubs. $39. Buy here. 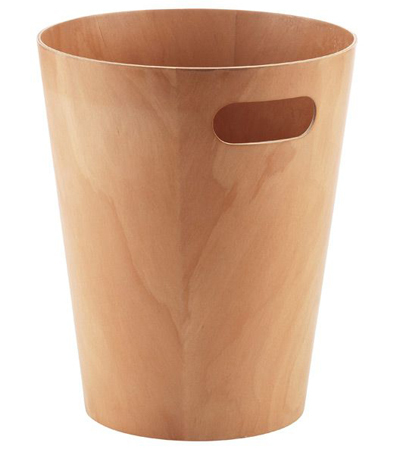 The sculptural appeal of the Umbra Woodrow Wastebasket in Natural makes it an elegant choice for use in the office or bathroom. A single cut-out handle adds style as well as function. $19.99. Buy here. 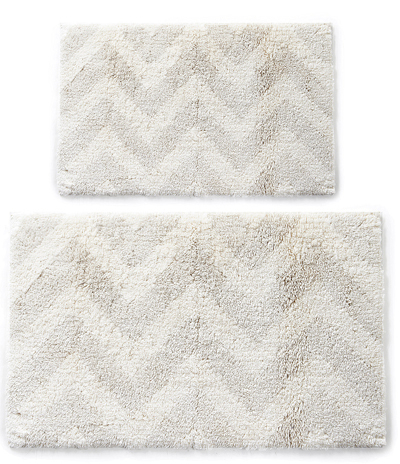 This Linen Blend Chevron Bath Rug Collection is soft and absorbent. Features a contemporary style and non-slip latex spray backing. 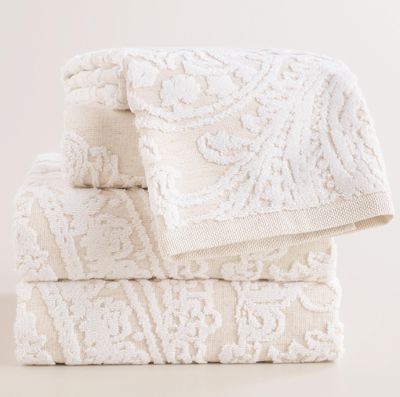 Crafted in Portugal from fine cotton and linen fibers. $79.99-$99.99. Buy here. 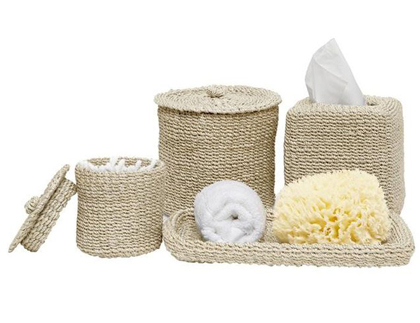 An organized addition to any bathroom, this beautiful and simple White 4-pc. Acrylic Bath Set makes your morning and evening routines a little easier. $44. Buy here. 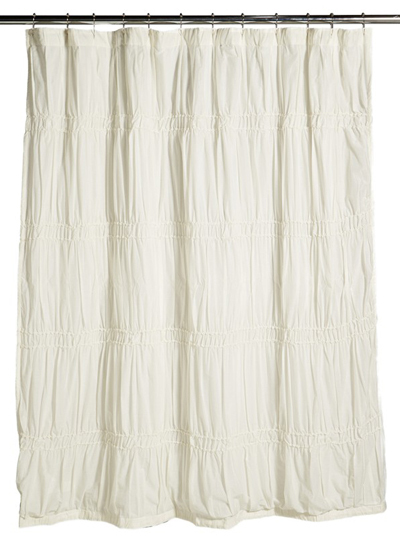 Ruching lends soft country charm to this cotton Isabella Shower Curtain. 72″ square. 100% cotton. $68. Free shipping. Buy here. 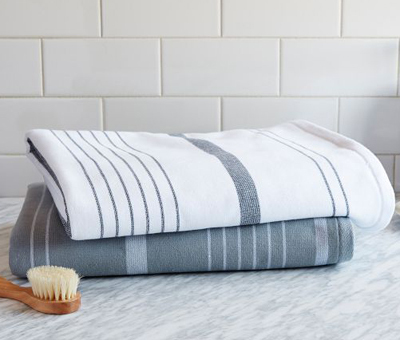 Made of yarn-dyed cotton on one side and terry towel on the other, these Row Stripe Towels combine softness with style. $8-$24. Buy here. 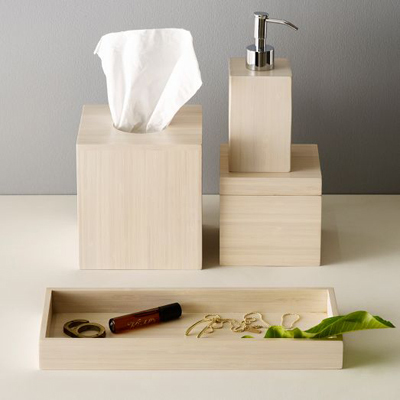 The creamy, subtle whitewashed finish on these Bamboo Bath Accessories makes them versatile enough to feel at home in a classic, contemporary or casual bathroom. Chrome accents add a polished look to the soap dispenser, while the box and tray can double as catchall storage in an entryway or bedroom. $19 Sale $14.99. Buy here. 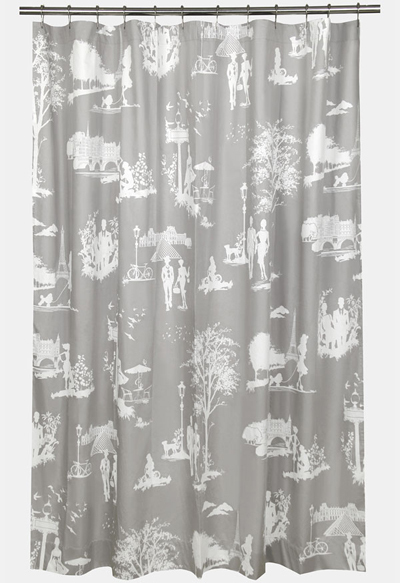 This Blissliving Home Madeline Shower Curtain features silhouetted scenes of romantic strolls through flowering French parks that bring to life the silky sateen shower curtain. $125 Sale $82.90. Buy here. This woven cotton Polka Dot Shower Curtain from Plum & Bow is topped with a playful dark grey polka dot print. Cheers up any bathroom space. 72″l, 72″h. $39. Buy here. 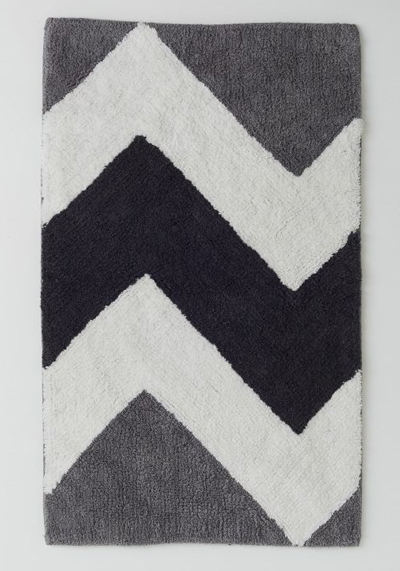 A bold chevron pattern and understated shades of gray make the Sebastian Bath Mat a perfect complement in any bathroom. Its 100% cotton, loop and pile construction is soft underfoot and it’s reversible so you can flip it over for even longer use. $29. Buy here. 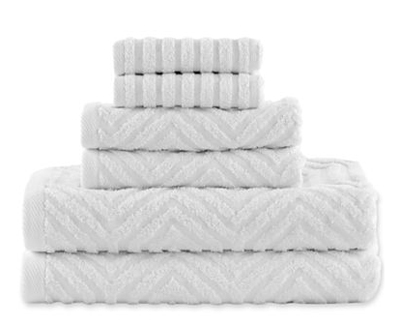 Dive right in to a chic bathroom with the luxurious cotton Happy Chic by Jonathan Adler Lola 6-pc. Towel Set. Set includes two bath towels, two hand towels and two face towels. $70. Buy here.